The strength of harissa can vary but this one contains crushed rose petals as well as chillies, so is more fragrant than fiery. It's a great stand-by for adding instant flavour and imbues a subtle taste to the Halloumi and chicken. 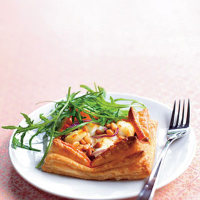 The tart only takes ten minutes to rustle up – after that, you can leave it to do its thing in the oven. Preheat the oven to 200°C, gas mark 6. Take the pastry out of the fridge now so it doesn't crack when unrolled. Unroll the pastry onto a baking sheet, then cut into 4 squares. Pierce all over with a fork, leaving a 2cm border around the edge of each one. Spread the harissa in the centre of each one, spoon over the onions and scatter with the chicken, Halloumi and pine nuts. Put the onion slices in a frying pan with the olive oil and cook over a medium heat for 3 minutes, stirring occasionally to encourage them to start softening. They will soften more in the oven later. Harissa can play havoc with the tannin and structure of youthful red wines, so try a savoury, dry white instead.